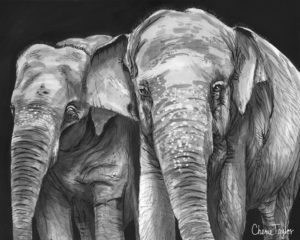 My artwork, “Elephant Couple”, will be on display and for sale) at The Fine Gallery in Leesburg, Virginia from April 6th to April 22nd. Public opening and Reception will be April 6th from 6-9 pm, although I am unfortunately unable to attend. Be sure to stop by and check it out!